Halloween creator John Carpenter's returning to the series for "the scariest of them all"
The master of horror is back in action on his most famous franchise. Reported by Comingsoon, John Carpenter is returning to Halloween in an executive producer role and already has big plans for the slasher sequel. "38 years after the original Halloween, I'm going to help to try to make the 10th sequel the scariest of them all," he said, while, I imagine, an amazing synth track played in the background. 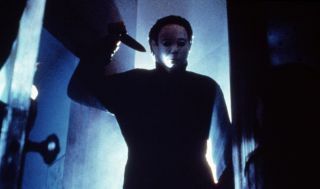 Michael Myers 10th outing is now being worked on by Blumhouse Productions as well as Miramax and Trancas International. Blumhouse - the tagline of which is 'the celebration of all things scary' - has spent the last few years making itself the go to studio for terror. From Paranormal Activity to The Purge, Insidious and Sinister, Jason Blum's team is known for its capacity to produce excellent horror. At the Halloween announcement, Blum himself revealed that he'd like to persuade Carpenter to do the soundtrack for the new movie. If anyone can legitimately reboot the series, it's probably this lot. No release date has been confirmed as yet but the announcment revealed that an October 2017 window is looking likely. Time to ready your spray painted Shatner mask.